The OddsMatcher tool will be the most useful tool to you when matched betting. It saves a huge amount of time and effort and can increase your matched betting profits significantly. 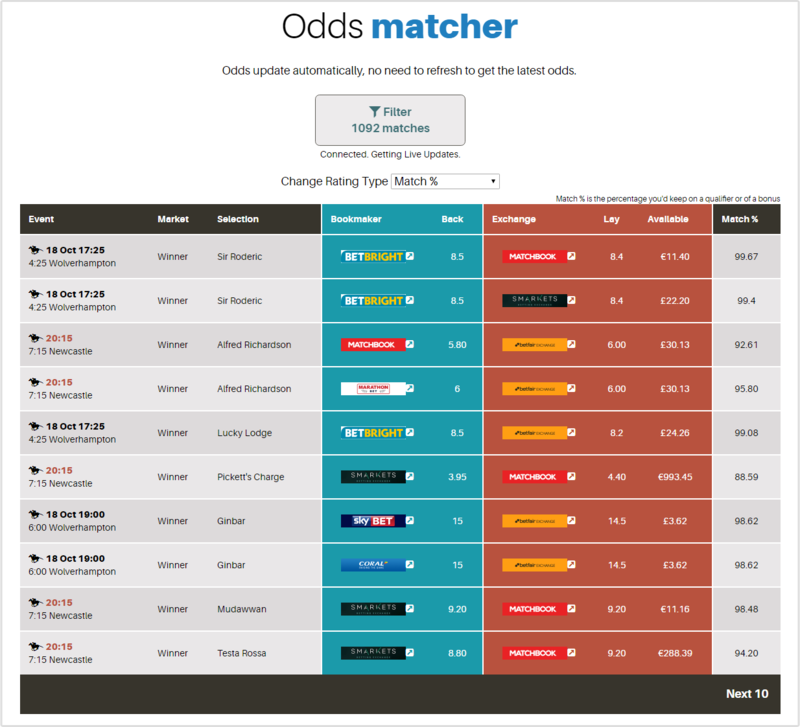 The OddsMatcher compares the back odds of an event to the lay odds on the betting exchanges. By doing so, you’ll be able to view the closest matches to return the highest possible profit from your free bets. You can use the OddsMatcher for a number of offer types such as free bets, qualifying bets, bonuses, money back if offers and many more. With odds and liquidity changing frequently for different markets, it can often be difficult to find a close match. However, the odds in the Profit Squad OddsMatcher update in realtime so that when they change on the bookmaker or betting exchange, they update in the OddsMatcher without the need to refresh the results manually. The OddsMatcher will display the best matches in order based on how close the back and lay odds are. You can also view the results for various offer types such as SNR (Stake not returned), Free Bet on Win and Win Boost allowing you to find the best matches and extract the most profit from all of your bet offers. The default setting on the OddsMatcher displays results for up to 100% rating which would be when the back odds are the same as the lay odds (excluding exchange commission). However, by increasing the max rating in the filter to greater than 100, you are able to view available arbs should you wish to. There are also various other filter options which allow you to find the perfect match depending on a number of variables. You’re able to filter the results to only display matches from specific bookmakers or betting exchanges, specific sports, markets or events, set the min or max odds to be displayed, view events starting before or after specific times or view only matches which have a minimum amount available to lay on the betting exchange. Once you have found a suitable match in the OddsMatcher, simply click on it to open up the matched betting calculator which will be pre-populated with the event, market, back & lay odds and exchange commission. All you need to do is select the bet type, eg, qualifying bet, free bet etc, enter your stake amount and the calculator will display the optimal lay stake in order to return the highest profit. The OddsMatcher tool is just one of many useful matched betting tools you’ll find on ProfitSquad which help make matched betting easier, quicker and more profitable.